On a little red potato treasure hunt. My favorite kind of sky. 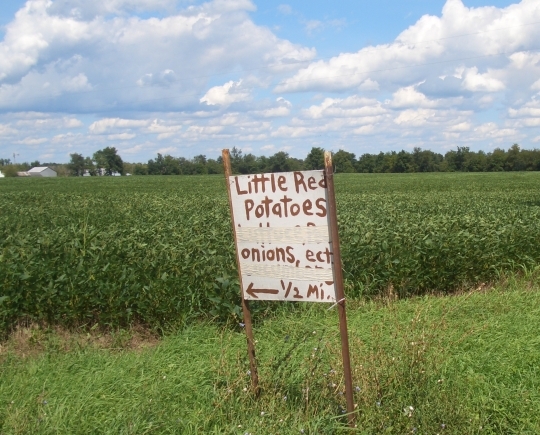 While farming is still important to many Amish, others have started small enterprises. 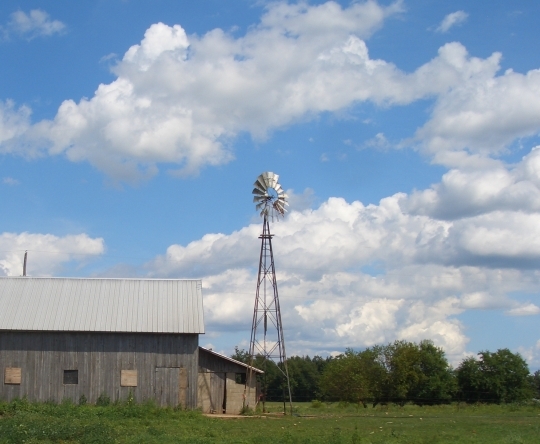 Michigan Amish businesses include small stores, carpentry crews, and woodworking shops (read more on Michigan Amish furniture). I’m actually returning to Michigan today (I have been in Elkhart-Lagrange, Indiana the past couple days, if you like you can read more here on Amish in Michigan). I’m meeting with Lovina Eicher and Kevin Williams, aka The Amish Cook and The Amish Cook’s editor, at Lovina’s home. Looks beautiful. Peirogies, mmmmmm, had them last night for supper. Get homemade ones from a local Ukranian church nearby. I did enjoy it Kevin, thanks. I spent a summer in Three Rivers back in 1998, other than a brief afternoon a few years ago, this was my first time back. Great pics! I was just in the Lagrange/Elkart area 2 weeks ago. Did you get to Goshen or Ligonier? They are two of my favorite small towns. So charming and full of interesting history. For those who don’t know, Ligonier was once called “Little Jerusalem” because it was home to many wealthy Jewish families at the turn of the century. Their mansions line Main St, and their is a sizable Jewish cemetery there. The Strauss (relatives of Levi) and Mier families were just two of the notable residents. In fact there are only 34 Jewish temples left in America and Ligonier has one of them, which is now a museum. None of the Jewish people are left there, as many of the offspring married into wealthy New York families and left the area. But their impact is everywhere in the architecture of this tiny Indiana town. Right on the edge of town is the large, abandoned and crumbling Mier carriage factory. It is being overtaken by nature, and is a beautifully eerie site for those fascinated by industrial ruins, as I am. I didn’t realize there were so few temples remaining. We have a small Jewish temple here in Owensboro, KY. From what I’ve been told, it is quite old. We also have a small Jewish Cemetary located on Hwy 54. I remember having a thriving Jewish community when I was in school back in the 60s-70s, but apparently most of them have moved away. I do believe there is an occasional visiting Rabbi who has services here though. I do know the temple is on the historical register here and is quite beautiful. Candis I drove through Ligonier yesterday but did not know that about its history. Very interesting. I lived in Goshen for 4 months once. Love the town. I am not sure what you mean by Jewish Temple, but if it is a place like a church where Jews would gather for worship, then there are a lot more than 34. According to jewfaq.org/movement, Reform Jews have about 900 Temples in USA and Can., Conservatives about 750 and Orthodox Synagogues not stated, but may be as high or higher than the previous two combined as Orthodox Jews have smaller sized Synagogues and higher attendence rates. I think maybe what you are referring to perhaps, is that 34 Jewish places of worship have been declared national monuments? Just beautiful! Makes me want to go to Indiana and see where my husband grew up. See if we can locate any of his Amish relatives. It does look like the Indiana Amish are poorer than other Amish communities. Especially the Lancaster Amish seem pretty well off. Beautiful photos, Erik. Glad you are having a great trip and looks like superb weather. Thanks for sharing. Be safe in the rest of your travels. Thanks Kathy. Travels are winding down. My philosophy is to pack 4 weeks of visiting into 2 weeks of time. So I’m usually a bit worn out at the end, but it’s a happy sort of worn-out. I don’t think I’ve seen any stuffed dumplings in Amish cooking, but there must be something, since every culture has stuffed dumplings! Lovina will know! In the meantime, as someone who makes both noodles and pierogies, I can tell you that noodle dough is exactly the same recipe as pierogie wrapper.If you come this way I will make all the pierogies you can eat – potato and cheese, sauerkraut or mushroom. I make good bortscht, too. Magdalena, I love Amish food and take several trips to Shipshewana, IN each year. I’m wondering where you are located. My husband would love those fresh pierogies! Haha.. We live in Grand Rapids, Michigan and there is a little Polish market, Lewandoski’s where we buy our homemade pierogies, kielbasa, etc. I AM WONDERING ERIK DID YOU COME TO GOSHEN THAT IS WHERE I LIVE IF SO WHERE DID YOU VISIT IN GOSHEN??? 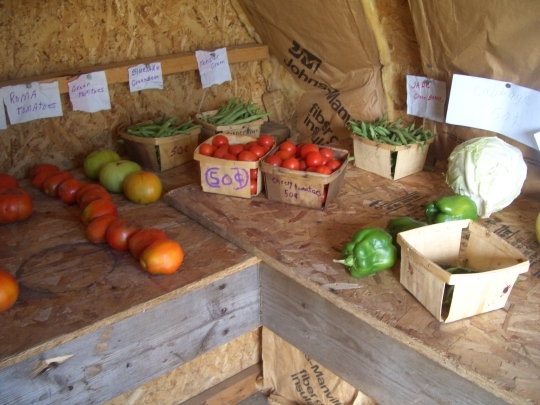 AS FAR AS GOSHEN AMISH BEING POORER THAT IS NOT TRUE THERE ARE ALLWAYS SOME POOR EVERYING THING EVERY WHERE YOU GO LANCASTER IS SO BIG BUT APPLES TO APPLES THEY ARE THE SAME. Sue I haven’t been through the town itself yet but in the “Goshen Amish” area. 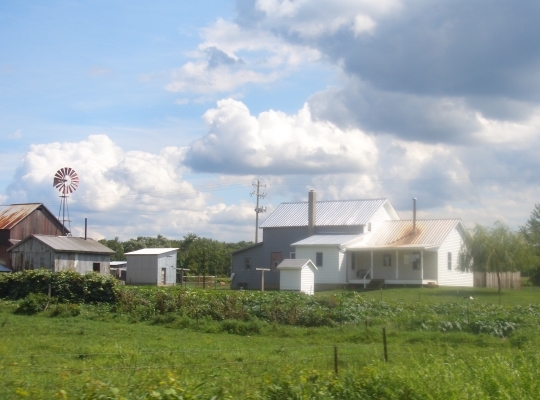 I lived in Goshen for a summer back in 2006, very nice place. Love Pierogi’s never had Amish ones tho….maybe Lovina will make you some…..and some of her chocolate chip cookies that Kevin gave away on a contest….that I had hoped to win…..after trying twice to win them, never did……I could almost taste her chocolate chip cookies…..so make sure you eat some for me if she has them…..
"Rebecca on the Beach" by Kevin ??? I did a library search in the Grand Rapids Public Library and Melcat, our state extended library, and have come up with nothing. Can someone give me an idea what subject matter this book covers and where it might be found? Thank you for the info, Kathy! Erik,Forgot to ask where is Branch county Michigan ? I lived in Michigan for probably over 30 yrs. (about 20 miles from Detroit,and what we called the DOWNRIVER area ) don’t really remember seeing any Amish in MI !!! We always went to SHIPSHEWANA to visit them…..what large city is it close to ? 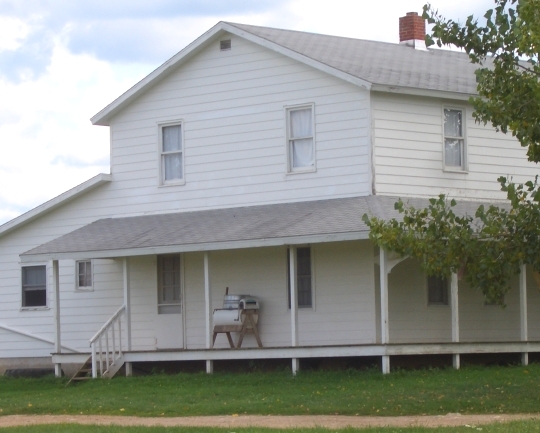 In the last picture the one of the white house is that a wringer washer sitting on the porch? Oh I remember them, I didnt like mine tho. I do how ever always hang up my wash outside. Beautiful photos, beautiful weather! Enjoy it while you can! I’d sure be interested in Amish pierogis. (Walmart has Amish potato salad…I wonder how “authentic” THAT is?) Even though I grew up amidst Polish-American cooking, I was picky about pierogi—only liked the sweet ones, cheese or plum. Magdalena, I’ll bet your kitchen smells like my mother’s did…fond memories of something good always cooking—kluski in homemade chicken soup was a favorite of mine! Candis, I’d love to see pix of the old carriage factory…sounds like something I’d like to visit for Halloween! I grew up playing Tether ball at school. We even had one at home! Loved it! 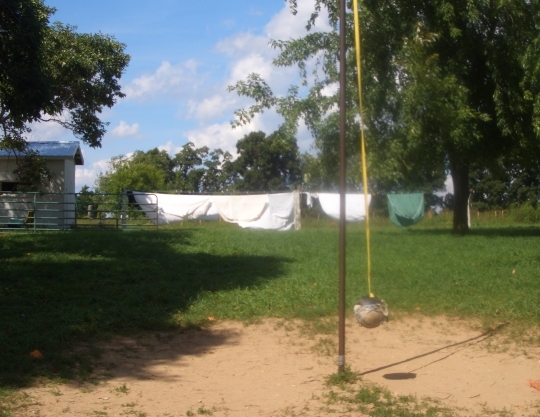 Some of my fondest memories as a child is playing tether ball! I wanted to tell you that in Pennsylvania German cooking there is a semi-circle shaped pasta that is stuffed with mashed potatoes and cooked in a beef gravy. They are called boova schenkel or boys’ legs. If made to tradition they are about four times larger than a pierogie and very tasty. If you’re interested I can get you a recipe, or ask Lovina, she may know of them. They are usually a winter dish in my home. The Lancaster County folks may be familiar with them too. I’m not sure if boova schenkel extend beyond Pennsylvania or not. I can tell you more about the tradition behind the name of them too if interested. Terry, just by the name I can tell boova schenkel are good. I may even start calling pierogis “Polish boova schenkel”. If I don’t get them this trip I’ll ask for them next month when I’m in PA.
Brown the beef and stew if for two hours until tender. During the last hour make a dough from the following: Sift together the flour and baking powder. Cut in the lard and first 2 TBsps of butter. Slowly add the water to form a dough. Cut the dough into six pieces and form into balls. Allow the dough to rest 20 minutes. Roll the dough balls out into 8 inch ovals and set aside. Put potatoes in a pot with enough water to barely, season with salt and pepper to taste, cover and cook until tender. Drain the water and mash the potatoes. Allow them to cool slightly and then mix in the beaten eggs, butter, onion, and parsley. Allow to stand another ten minutes. Divide the mixture evenly among the dough circles/ovals. We the dough edges and fold the oval in half to cove the potato mixture forming almost a half moon. Seal the edges well. Drop into the beef broth and cook with the meat for 30 minutes. Remove the boova schenkel from the broth and brown slightly in the remaining 4 TBsps of butter. To serve put one boova schenkel on a plate and sauce with the beef and broth. Garnish with a little more chopped parsley on the top. This will serve 4-6 people depending on how hungry they are. Enjoy!! PS: If you are from Raleigh you are probably familiar with my group of Brethren. I’m Moravian Brethren, we founded Salem. I know I have never eaten perogies with gravy. It is not my family’s standard, but mind you, growing up I’ve never associated perogies as music festival food either, and a local Polish food restaurant has had a booth in the food court of a local event the last few years. Last time I actually picked out a festival meal, I went Arabic, but it looked Greek to me. Can you get the recipe? It sounds good. You can email it to me at TNWF@aol.com. Thank you. I read that Branch county is near Coldwater, I’m off to Shipshewana and Fort Wayne next week, and would like to know what other cities are near Branch county? Love your pictures. I too like taking pictures of the sky. Perogies, we love to make them in the cool weather. I love the cheddar and potatoe, but the saurkraut and bacon are tasty also..if anyone want a good recipe let me know..
T Marie B.–May I recommend Goshen, Ligonier, Kendallville as very historic and interesting small towns? If you strictly want Amish stuff, ask at any hotel or visitor center in the Napannee/Goshen/Elkart area for the Summer Quilt tour. They will give you a free CD to play in your car with a WONDERFUL driving tour of all things Amish, complete with turn-by-turn directions like a GPS. Also packed with info on each area and history of the Indiana Amish. We just loved it and even did it twice this summer. You can do the whole drive in under 4 hrs and it really is fabulous. NE Indiana is chock full of quaint and historic small towns and many are around Ft Wayne. Good luck and have fun.